Streaming media devices are especially designed to play, stream and control video-sharing websites such as Hulu, You Tube and Netflix. This media device enables the users to connect the video display device to the internet in order to easily access online steaming contents. Streaming media tools allow the on-demand or real-time presentation and dispersal of audio, video and multimedia content over a communication channel, usually a dedicated IP network or internet managed by a facility provider. With the introduction of streaming media, there is no need to load a file to play it, because the media is directed in a constant stream of programs, as a result, user can play the media as it arrives. Users have the capability to reverse, pause or forward the streamed file, as the user can ensure with a downloaded file. Streaming media has played an important part in stirring internet experience for both enterprises and folks. The global streaming media device market was valued at US$74,112.6 mn in 2015 and is anticipated to increase at a CAGR of 16.7% from 2017 to 2025. The streaming media device market is experiencing growth owing to factors such as easy connectivity with electronic devices, growing assimilation of digital content with streaming media devices and growing adoption of cloud services. The incorporation of the streaming media devices with digital video content, offers flexibility to watch or listen the video/audio files anytime. Adoption of cloud services to improve mobility and portability of the media devices is growing rapidly. The growing consumer preference toward access-based method, which allows subscribers to access video libraries or digital content stored in the cloud has boosted streaming device producers to spend in cloud computing services for higher profitability. Apart from this, increasing investment in webcasting to hold company expenditure is also a major factor impelling the streaming media device market to grow. The global streaming media device can be segmented on the basis of type, application, end-use and region. By type, the streaming media device market is segmented into smart TVs, media streamers and gaming consoles. Out of these, the smart TVs are gaining exponential popularity. As of 2016, this device segment held a share of 60% in the global market. Analysts predict that the consistent demand for high resolution display screens is likely to keep this segment at the forefront. The application based segmentation includes social networking, web-browsing, gaming, real-time entertainment, and E-learning. On the basis of end-use, the streaming media device market is segmented into commercial and residential. Geographically global streaming media device market is segmented in North America, Europe, Asia-Pacific, Middle East and Africa and South America. North America is estimated to hold the major share in the market owing to the tech savvy population in this region. Furthermore, Asia Pacific is anticipated to be among the major adopters of the streaming media device during the forecast period. The streaming media device market in the Asia Pacific region is in its promising stage, and the rising inclination of users toward advanced technological products is expected to improve the growth in the region. Besides this, the growing adoption of video-on-demand services and growing awareness about streaming devices is also anticipated to boost the demand for streaming media devices in Asia Pacific region. The major players in the global streaming media player market includes Google, Inc., Microsoft, Sony Corporation, Roku, Inc., Samsung Electronics Co., Ltd., ASUSTeK Computer Inc., LG Electronics, Inc., Apple, Inc. and Philips Electronics. This report provides an analysis of the global streaming media device market for the period of 2015 to 2025, wherein the period from 2017 to 2025 comprises the forecast period and 2016 is the base year. Data for 2015 is provided as historical information. The report covers all the major trends and technologies playing a major role in the growth of streaming media device market over the forecast period. It also highlights various drivers, restraints and opportunities expected to influence the market’s growth during the said period. The study provides a holistic perspective on the market’s growth in terms of revenue (US$ Mn) and volume (Mn Units), across different geographical regions namely North America, Europe, Asia Pacific, Middle East & Africa and South America. Streaming media devices are especially designed to play, stream and control video-sharing websites such as Hulu, You Tube and Netflix. This media device enables consumers to associate a video display device to the internet, to easily access online available contents. Currently, vendors are more focused on aiding organizations of all sizes with an aim to drive business creativity by rapidly transforming ideas into advanced and secure omni channel applications. 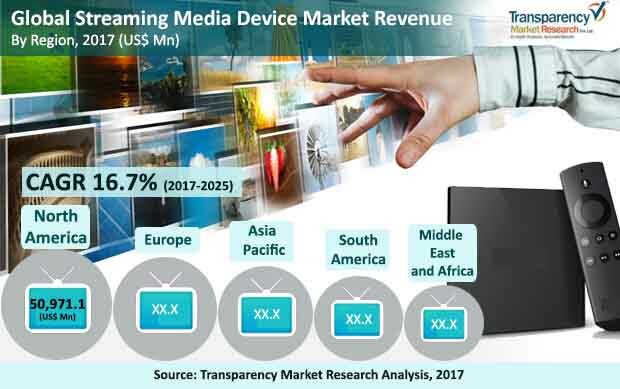 The streaming media device market is experiencing growth owing to factors such as easy connectivity with electronic devices, growing assimilation of digital content with streaming media devices and growing adoption of cloud services. The incorporation of the streaming media devices with digital video content, offers flexibility to watch or listen the video/audio files anytime. Adoption of cloud services to improve mobility and portability of the media devices is growing rapidly. The market overview section of the report showcases the market dynamics and trends such as the drivers, restraints and opportunities that influence the current nature and future status of this market. The report also provides ecosystem analysis and key market indicators for the streaming media device market. The streaming media device market data estimates are the result of our in-depth secondary research, primary interviews and in-house expert panel reviews. These market estimates have been analyzed by taking into account the impact of different political, social, economic, technological and legal factors along with the current market dynamics affecting the market growth. Streaming media device market is bifurcated by type, by application, by end-use and by geography. By type, the global streaming media device market is categorized into smart TV’s, gaming console and media streamers. Among these, smart TV and gaming console segment are the major segments which are expected to fuel the growth of streaming media device market over the forecast period. The application based segmentation includes gaming, real-time entertainment, social networking, e-learning and web browsing. On the basis of end-use, the streaming media device market is segmented into commercial and residential. The report also includes competitive profiling of the key players associated with the streaming media device around the globe. The important business strategies adopted by them, their market positioning, financials, SWOT analysis and recent developments have also been identified in the research report. The competitive landscape section of the report also gives an overview about the major contributing regions/countries by these key players in order to strengthen their market position in the future. The major players in the global streaming media player market includes Google Inc., Microsoft Corporation, Sony Corporation, Roku, Inc., Samsung Electronics Co., Ltd., ASUSTeK Computer Inc., LG Electronics, Inc., Apple, Inc. and Philips Electronics. Details such as financials, business strategies, SWOT analysis, recent developments, and other such strategic information pertaining to these players has been duly provided as part of company profiling.